It's another cash giveaway! 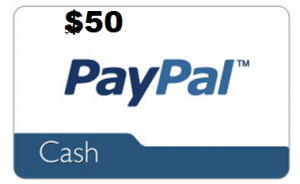 Up for grabs is 1 prize of $50 Paypal Cash thanks to A Little bit of Everything, Mama Papa Barn, and Faerotic Prose. A Little Bit of Everything has lots of events coming up including a Father's day Playstation giveaway and the Summer Celebration which has FREE blog sign ups. Enter on the Rafflecopter form below from May 16 12:01AM EST to May 24 11:59PM. Open Worldwide, 18+. Good luck! Please take the time to enter my other giveaways while you're here. Disclaimer: Please view my full disclosure. Winner to be announced by A Little bit of Everything. i would go shopping for a new pair of shoes. @dusty katt, Thanks for letting me know. I'll forward that to the rafflecopter host. I would buy house paint with it since we're in the middle of a remodel and every little bit helps. I would like to buy some cooking books!! I would buy some more bedding plants for my flower garden. i would use it to buy this really awesome necklace i saw on Etsy! I would buy a pair Of Trainers for myself. I would love to win and use it towards my computer! I'd put it in my vacation fund! Yay! I desperately need some new summer clothes so thats what I would do with this. Use it for our anniversary this weekend.